Discussion in 'Football Recruiting' started by HotMic, Feb 12, 2019. Offers coming in for Craig. I think this is just the beginning for him. Fort Wayne defensive end Deontae Craig has three stars compared to the 14 2020 defensive ends Ohio State has offered that boast four and five stars. But that didn’t stop new co-defensive coordinator Greg Mattison from continuing his relationship with Craig once he took his new job in Columbus. Mattison had approached Craig while he was serving as Michigan’s defensive line coach, and the two had developed a good relationship, Craig said. 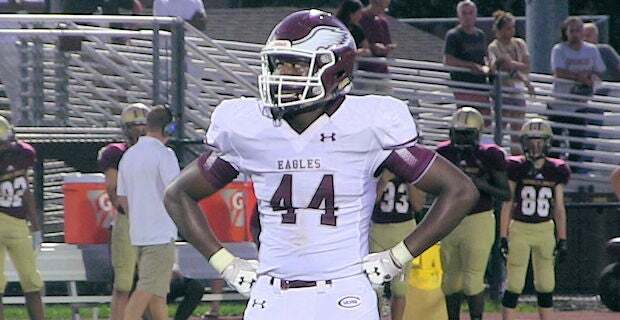 The 6-foot-4 defensive end didn’t receive an offer from Michigan, but Mattison, who Culver Academy head coach Andy Dorrel said has been the most enthusiastic about Craig among the Ohio State recruiters, extended one from Ohio State. While the offer would allow Craig to play in Columbus if he chose to, he said Mattison’s change in location doesn’t change the way he views either Michigan or Ohio State. Craig talks about his recent offers and possible visit plans. pnuts34, mendensa, brodybuck21 and 3 others like this. Kid is gonna be special. I mean, people have no idea how hard it is to spin a picture perfect ball like that. Very impressive. It’s all in the shutter speed...right @jwinslow ? brodybuck21, jwinslow, Fungo Squiggly and 1 other person like this.